Lois Sawyer Weir, born March 15, 1930 in Escanaba, Michigan, passed away on December 21, 2017, surrounded by her children, Tom, Penny and Mary Sue at her home in Boca Grande, Florida. Lois grew up in Escanaba, MI, where she met her husband Cliff, of 60 years, while racing 21-foot Sea Gulls on Lake Michigan. Lois and Cliff’s love for being on the water brought them to live in Shelter Island, New York, Tortola, BVI and ultimately Boca Grande. Lois had a background in interior decorating and an eye for fashion. Her flare for style and grace was brought out not only in her fashion and decorating but also in her jest for life and love of entertaining; hosting unforgettable activities such as her annual “crazy ladies get-togethers”, “dog show events”, “hat parties” and ”wedding anniversary gatherings” as well as her crazy and creative participation in the Boca Grande bike parade. Lois found an outlet for her creativity and generosity in the NJ Decorator Showcase Homes, the Boca Grande Women’s Club and the Garden Club, the Boca Grande Art Alliance, the Shelter Island Yacht Club Entertainment Committee and the Mashomack Preserve’s Annual Benefit Dinner Dance Committee. In true Lois Weir style, her ultimate gift, at age 74, was spending a week at the San Andres Episcopal Church in the Dominican Republic as part of the Venice Deanery missions project to help refurbish the church built in 1961. Lois was predeceased by her husband Cliff and grandson Sawyer. 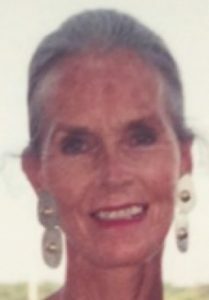 Lois is survived by her three children: Tom Weir of Pensacola, Florida, Penny Oakley of Southport, North Carolina and Mary Sue Weir-Kovalchuk of Minneapolis, Minnesota; five grandchildren: Nicole, Hannah, Anna, Kristin and Collin; and three great grandchildren: Grant, Mason and Skye. A memorial service will be held on Saturday, January 20, 2018, 11:00 am at St Andrew’s Episcopal Church in Boca Grande, Florida. In lieu of flowers, please send donations to Boca Grande Garden Club, 131 First Street West, Boca Grande, Florida 33921 or Mashomack Preserve, P.O. Box 850, Shelter Island, New York 11964.